Made with British grown mint - perfect with roast lamb. 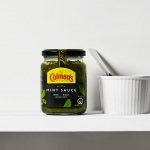 An essential condiment for lamb dishes, Colman's Classic Mint Sauce is made with British grown mint leaves that have been finely chopped and soaked in vinegar. Aside from its traditional associations with roast lamb, Colmans Classic Mint Sauce can be added to yoghurt to produce a lovely mint raita, and also works really well when eaten with mushy peas!